Thank you for your company and contributions this evening and please join us again this weekend for live Scottish Cup coverage. Think it's time for Deila to go. He gained the support of the fans last year but I haven't heard the Ronny roar at a Celtic game in a long while. I think that says a lot. "It was a sensational atmosphere befitting a top of the table clash. This was a game which could deliver a genuine title race. It did." Celtic on a domestic level are a shambles with loaned players half rate players and a system which doesn't work. Delia should resign. He's had enough time. Celtic don't deserve to win the league based on this.they've been complacent for years and are going backwards rapidly. 'mon the dons!!! 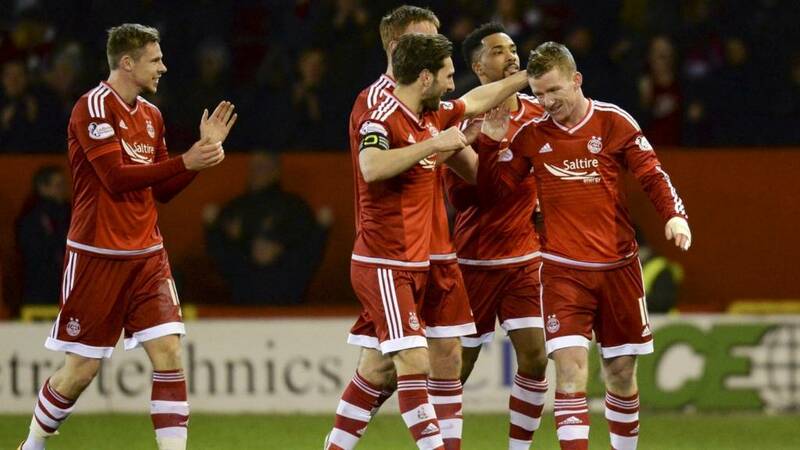 Aberdeen claim their second win over Celtic this season after first-half goals from Jonny Hayes and Simon Church. The result cuts Celtic's lead at the top of the Scottish Premiership to three points and both sides still have 14 games to play. Leigh Griffiths sidesteps a couple of challenges and finds the bottom right corner with a low shot. Too little too late? "Aberdeen deserve this. They've continued to attack with Celtic appearing largely toothless and lacking in creation and desire. "Ronny Deila will be criticised but Derek McInnes should take the spotlight. He's done a magnificent job with this Aberdeen side." Cammy Smith takes over from opening goalscorer Jonny Hayes. Scott Allan came on moments ago for Celtic in place of Mikael Lustig. Erik Sviatchenko ventures forward to boost the Celtic attack, is found by Scott Brown's reverse pass and then fizzes a low ball across the face of goal. No takers for the visitors. Aberdeen's Adam Rooney goes down in the Celtic box after being chased by two defenders but referee Steven McLean is unmoved by the spot-kick appeals. Into the last 10 minutes. This has been coming for Celtic. Very lightweight, in both boxes. Griffiths needs help. I cannot believe the blind faith many fans have shown deila/board. How can other top five sides assemble decent defences on a shoestring, but not us.